This stainless steel bottle opener is wrapped in a beautiful Rose' faux leather material that personalizes to an elegant black contrast. The magnetic back allows you to keep it handy, attached to the fridge when not in use so no more digging through "the drawer" to find it when it's needed. The budget friendly price point makes it a unique promotional item to get your business or organization's logo out there in the public eye, or a personalized gift that's both attractive and useful. This 6 oz flask is covered in light black leatherette for a unique look and feel. Personalized to a rich gold color and finished at the top and bottom with white top stitching all around, this makes a great incentive, promotional item or gift for any occasion. This large 20 oz tumbler features double wall vacuum insulation for 2X the heat and cold retention of a traditional travel mug. The bottom is tapered with a unique "ringneck" design and will fit most cup holders and features a clear lid. Available in 14 colors and powder coated for durable beauty it can be personalized with a logo, monogram or other graphics. 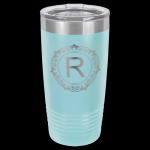 This awesome tumbler makes a great incentive, promotional item or personalized gift. This beautiful wine tool set is made of finely crafted light brown leatherette, a richly textured synthetic material that offers the look and feel of leather at a fraction of the cost, as well as superior durability. The black velveteen lined box features a magnetic closure and includes a corkscrew, a stopper, decanting pourer with stopper, and a drip collar that are held securely in place in black foam. The box can be personalized to a stunning black contrast with a logo or other graphics to make this handy set a wonderful incentive, promotional item or personalized gift for any wine lover. This handy little manicure set includes a cuticle pusher, ear cleaner, tweezers, file, scissors, and two clippers. Encased in beautiful leatherette that can be personalized with a logo, monogram or other graphics, it makes a wonderful promotional item or personalized gift. Soft, durable light brown leatherette gives this attractive checkbook cover a high end look at a low budget price point. The cover can be personalized on the front, back and inside flap to a bold black contrast with your logo or other graphics allowing for lots of options. Two flaps on the inside hold the checkbook securely in place. If you are a financial institution or any business looking for a great give a way for new customers or an inexpensive promotional item that will surely impress, this practical item is perfect. Combined with other leatherette items or even on its own, it also makes a great personalized gift.